Ignacio Rodrmguez Iturbe of Venezuela won the Stockholm Water Prize, 2002 for his scientific contribution to the understanding of the interaction between climate, vegetation, soil structure, surface water, floods and drought. Scientists, all over the world, are conducting research for the efficient utilization of their water resources, not only promoting the agricultural sector but also producing electricity for different fields of life. But in Pakistan, we are busy with the controversial debate about whether a specific dam should be constructed or not. We have been facing drought-like conditions for the last few years. Our largest reservoirs of water are facing acute shortage and are touching the dead levels. There is also the severe problem of sedimentation. We are wasting 35-40 MAF water annually without it being utilized for irrigation purposes. The prices of electricity are hiking day by day because our hydropower plants are not meeting the demands of the country and we have to purchase this energy from the private sector at higher cost. A report published by the consultants, Montreal Engineering in 1984, that Pakistan’s hydropower potential in 50,000 MW and we can produce 30,000 MW on only Indus river between Tarbela and Skardu by constructing Basha (3581 MW), Dassu (3728 MW). Bunj (1290 MW), Thahkot (2415 MW), Yugo (1000 MW) and Skardu (4000 MW) dams with water storage capacity of 15.5 MAF. This a long debate but we have to discuss the type of techniques we can adopt to improve our agriculture sector with these limited resources. Cotton is our major cash crop with 60 per cent of our export comprising of cotton or cotton products. 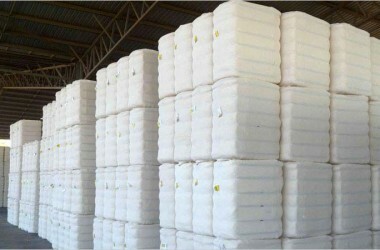 The government is promoting cotton, where it can be successfully cultivated, because other kharif crops like rice and sugar-cane require plenty of water to mature. In some parts of Balochistan, cotton crop had been successfully grown last year and government is providing different inputs for cotton crop, at subsidized rates, especially in these areas. In some parts of the southern Punjab and most of the Sindh, having underground water not gift for the irrigation. These areas have to depend on the canal water totally. We cannot think about rice or sugar-cane in these areas because of this drought like situation, so we have to depend on cotton crop not only in these areas where underground water is not fit for irrigation but also in those areas where underground water is fit for irrigation because the hiking prices of diesel and electricity make the use of tube-wells costly and people have to meet the requirement of their orchards also along with their farming crops. Once cotton has been selected as a farm crop during kharif season, there are numerous techniques to reduce the use of irrigation water to mature a crop. Firstly, the selection of a variety. There are numerous tall and dwarf varieties of cotton available in the market. Each variety possessing different characteristics such as, total water requirement, duration between sowing and first irrigation, flower shedding, behaviour to temperature fluctuation and drought resistance capability, these are important features which should be considered in the selection of a variety in this prevalent drought condition. A variety which should be preferred for cultivation should be tall, having capability to easily withstand the temperature fluctuation, drought resistant and having less water requirement. The first irrigation requirement should be 55-60 days after sowing. The fertilizer requirement should be less and compensating capability after flower shedding should be higher. Different certified seeds like CIM473, MNH 554 and BH118 are available in the market, which possess the characteristics to survive acute water shortages. Plant to plant distance should be kept according to the recommendations of their specific variety. We should maintain the number of plants per acre at 25,000 to 30,000 to gain maximum yield. Out of these drought tolerant cotton varieties, MNH554 is not only the most drought resistant but can also be successfully grown in different types of soil ranging from sandy-loam to heavy-clay and even salinity affected soils. However, where underground water is fit for irrigation and abundant water is available for irrigation purpose, the varieties of cotton with high yielding potential can be successfully grown by meeting the water requirements of the crop. Secondly, the sowing method is important in saving irrigation water, preferably, the sowing of cotton should be done on ridges by dibbling method either manually or by planter. In this way we save 40 per cent of the irrigation water and attain the early maturity of the crop. In addition, the number of plants per acre can be maintained by re-sowing the vacant spaces of un-germinated plants. If sowing on ridges in not possible and in case of drill sowing, the land should be leveled and prepared extremely well for effective root penetration of the plants. The plenty of flooded irrigation should be provided at the time of Rami so that the field should retain sufficient moisture for plant roots for the maximum period of time. After hoeing and before first irrigation, the ridges should be developed by creating water channels in every alternate strip in drill -own crop and in this way we could save upto 50 per cent of the irrigation water. So by adopting better agronomic practices and better sowing method, we can save plenty of irrigation water. In addition to these, we can also save irrigation water by lining the water courses of the farm and also the water course coming from the canal distributory. Hence, eradicating the wastage of water by seepage which is also giving rise to water logging. Avoiding the flooded irrigation practices to orchards by drip irrigation or by water channels, we can also save plenty of irrigation water which can be utilized by the farm crops. MAF annually not only for agriculture but also for energy sector. The present government should adopt a long term policy on sound footings to save and efficiently manage the agriculture and energy sectors.